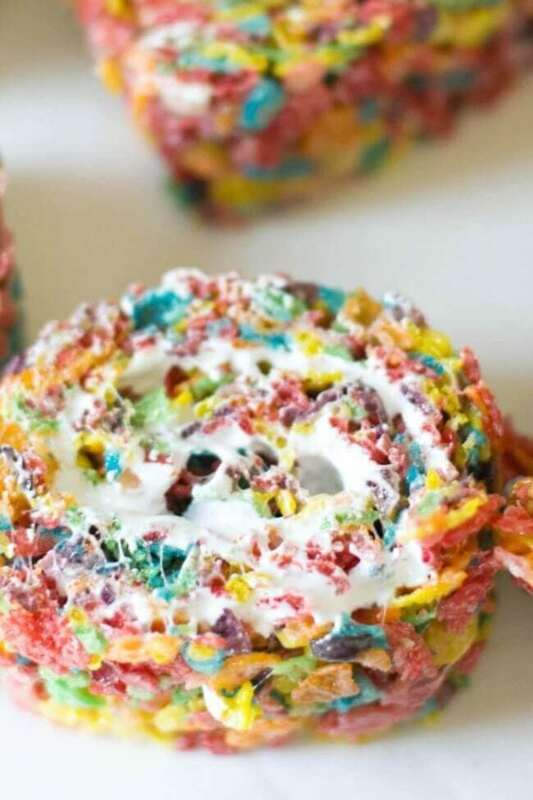 These Fruity Pebbles Marshmallow Treats are the perfect gooey, sweet goodie! Have you ever noticed how color affects your mood? Keep that in mind when you’re trying to decide on party decorations. 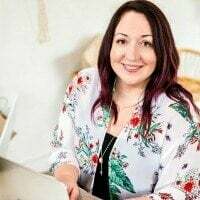 There are many, many awesome themes and colors to choose from for party décor, but I personally adore pops of color on a white background. Nothing lights up a kid’s face like the playfulness of bright color. Beautiful, bold colors can put a smile on almost anyone’s face. Balloons and banners in primary colors add excitement that help build anticipation for fun and games. Gifts and prizes can be wrapped and displayed as part of the décor too. I love it when dessert table treats also build on the theme ideas and colors. 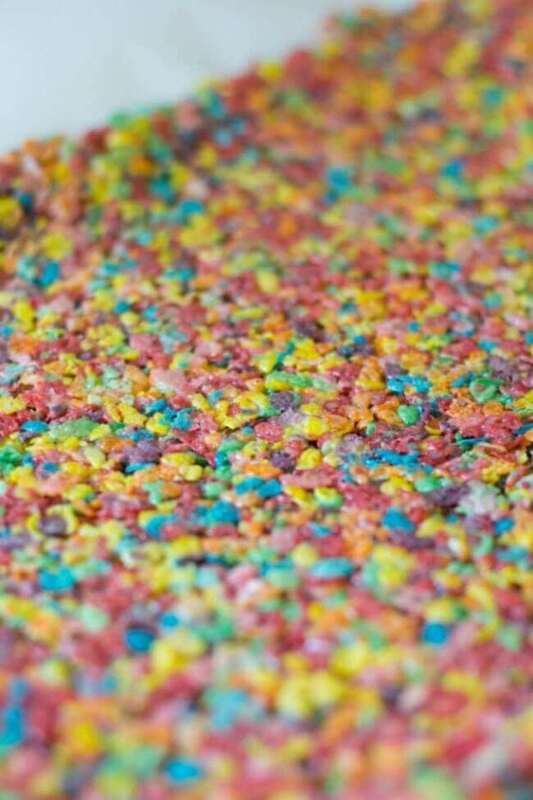 This easy, homemade Fruity Pebbles Marshmallow Treats recipe is a super way to add vibrant hues to a dessert table. Even though it’s a great morning wake-up cereal, to me Fruity Pebbles always look like they’re waiting for an invitation to party—they have that kind of happy, colorful energy that makes you feel like there are all sorts of possibilities just ahead. When combined with marshmallow and served in squares or a pinwheel, they become an extra amazing treat. Any food that looks this happy probably shouldn’t be reserved just for special occasion parties. It should make an appearance on your dining table on a regular, mundane weeknight that needs a little extra color and life in it. I’ve also been known to make this sweet treat when one of us needed a little cheering up after a long day. They do the trick, trust me. Make any day more fun for kids and kids at heart by adding this treat that pleases even before you taste it! Like their cousin, rice crispy treats, these marshmallow bars couldn’t be any simpler to make. 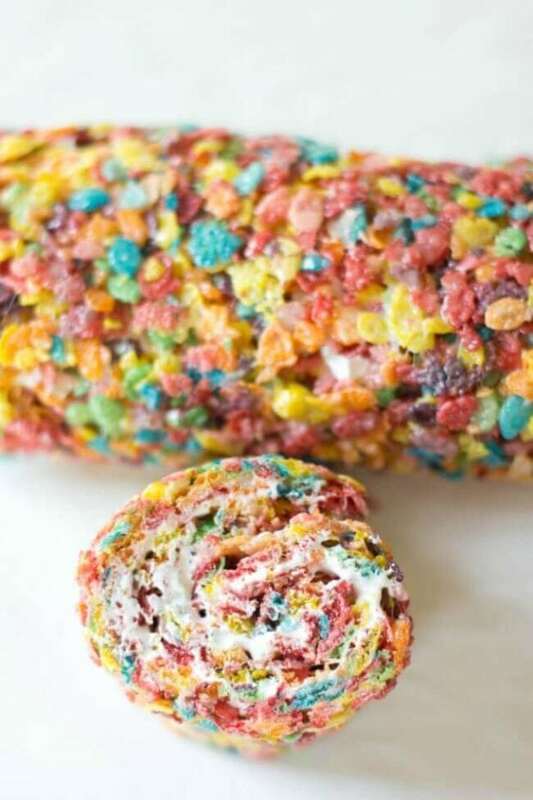 You’ll need Fruity Pebbles, marshmallows, butter and marshmallow fluff. That’s it — just four ingredients to create magic! In a large pot, melt butter. 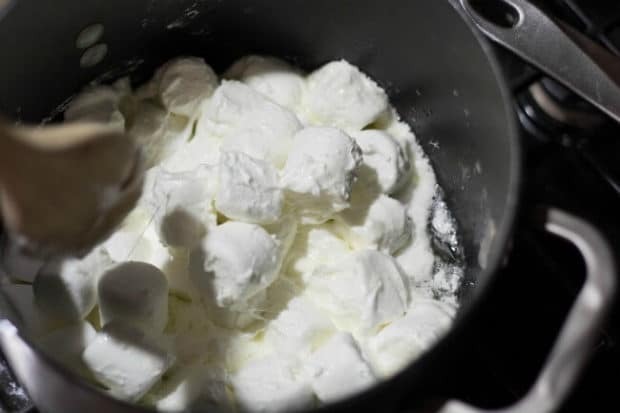 Add marshmallows and stir over low heat until marshmallows are completely melted. 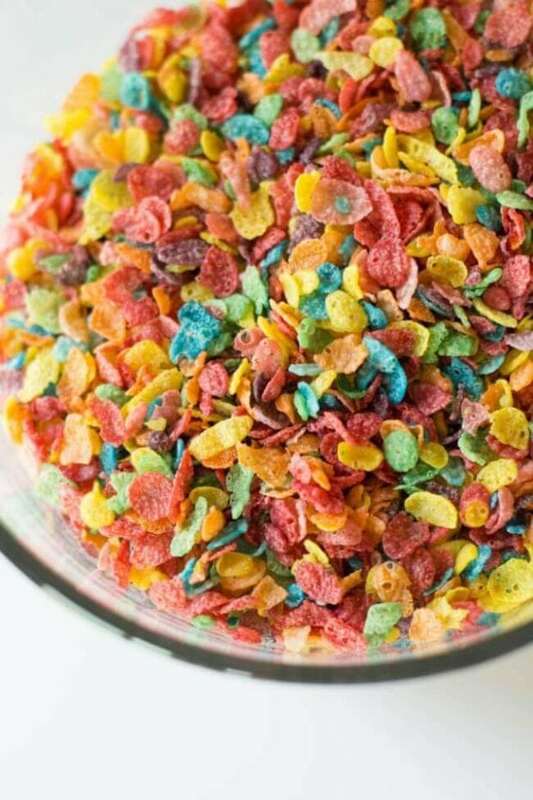 Stir in Fruity Pebbles until marshmallow is mixed throughout. Pour mixture onto a large piece of parchment paper and place another large piece on top. Roll out into a large rectangle, about 1/2-3/4 inch thick. I trimmed one side of the rectangle to make it even. Spread marshmallow fluff over the top. Gently roll the log up, rolling up the long side. 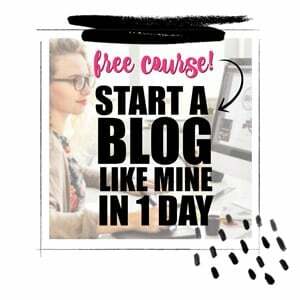 Allow to completely cool and then cut log into slices. 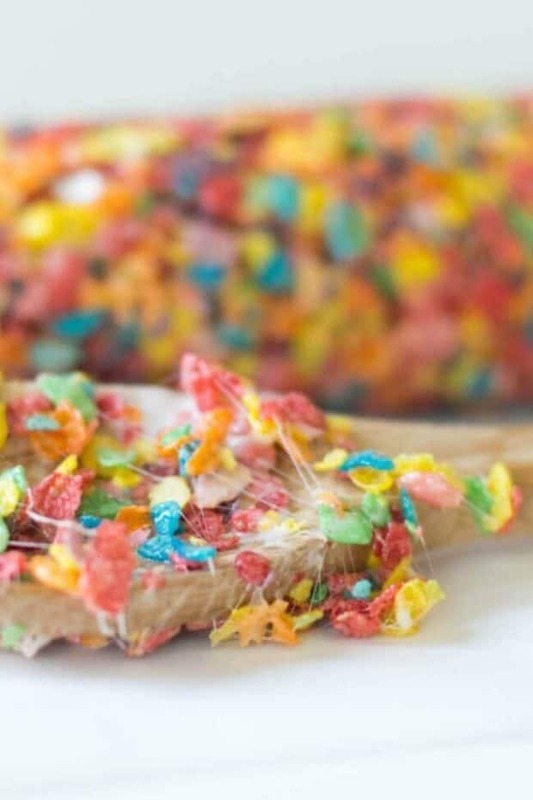 I hope you’ll enjoy this bright and colorful Fruity Pebbles marshmallow treats recipe soon! 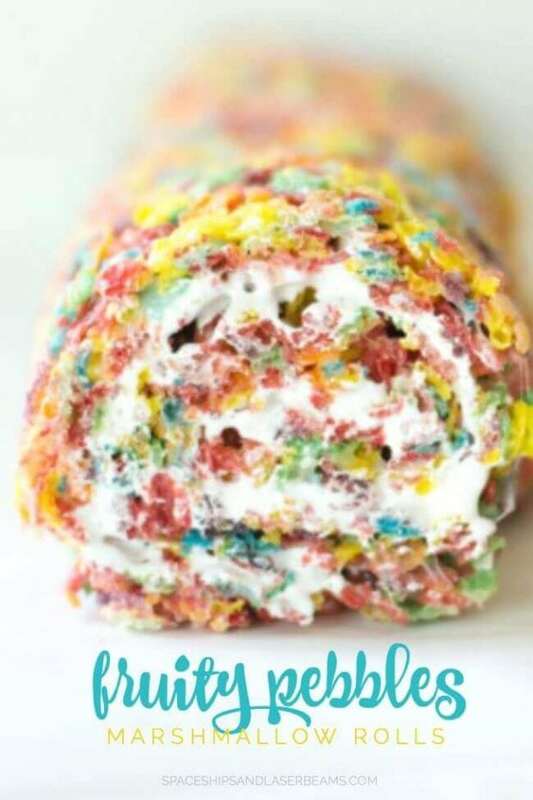 This colorful and fun treat combines the sweet crunch of Fruity Pebbles with marshmallow for an excellent snack!